Every summer, there are a number of interesting and entertaining music schools in which you can learn traditional Turkish instruments or hone your craft with master classes in classical instruments. These music schools, camps and master classes are also taking place in some of Turkey's most beautiful locations, making for an excellent opportunity to focus on music this summer. The Mısırlı Ahmet International Rhythm and Arts Camp returns for the 11th time this year, taking place from Aug. 11 to Aug. 26 in Edremit's Zeytinli district. Mısırlı Ahmet is a world renowned darbuka (Turkish drums) maestro, who even has even coined his own style of playing that has now become a worldwide practice. Every year, Mısırlı Ahmet, who also runs the only darbuka school in the world in Istanbul's Balat, takes his students and others interested to the woods for a fortnight of daily percussion classes. Musicians in the know come out from all over the world to take part in this unique event, due much in part also to its unique setting. Set in the forested hills of Edremit's Zeytinli neighborhood, which is located in the heart of the Ida Mountain (Kaz Dağları), participants will have the opportunity to camp out in the woods, learn percussion by day from this drumming legend and at night play rhythms by a dancing bonfire. Participants do not need to be skilled in the art of darbuka to attend this event. This relaxed atmosphere is also conducive to learning how to drum for beginners. Furthermore, there will also be a wide range of workshops in a variety of musical styles, dance and art taking place on the sidelines. The setting is in the mountainous woods, with forest creeks as swimming holes. Participants bring their own tents and can come for as many days as they like. A breakfast and a dinner buffet are served. During the days, there will be workshops on percussion and rhythm led by Mısırlı Ahmet himself. The camp's steadfast tradition has also been performing a concert for locals on one of the final days. Müzik Köyü, Turkey's first-ever "Music Village," is a project that was initiated three summers ago in the Yanıklar village in Fethiye with the mission of perpetuating traditional Anatolian music. Going into its fourth year, masters of Anatolian instruments such as the bağlama, üçtelli saz, kabak kemane, kemençe and many others will be convening in this summer music camp to train and perform for students and guests alike, who fly out for this event from all over the world. However, expertise is not a requirement as anyone is welcome to take part in what is a wonderful opportunity to become acquainted with a wide variety of traditional Anatolian instruments and musical styles. This summer camp is broken down into two sessions; with the first running from July 30 to Aug. 4 and the second, taking place between Aug. 7 and Aug. 10. This year's camp will be taking place in Kayaköy, a popular once-deserted town that has since become rediscovered. There will be over 30 musicians from all over the world, including Spain, France, Germany, Greece, Syria and Iran to teach 35 different workshops, give 50 seminars, and ten concerts as is planned for the event. A wonderful and unique opportunity to learn traditional Turkish instruments such as the kemancha, tanbur, cajon, all sorts of saz and oud and even zeybek dances and these are just some of the workshops planned. Options for accommodation include sharing rooms and camping out in tents. Every summer, two Aegean towns, namely Ayvalık and Gümüşlük host classical music festivals accompanied by master classes for the aficionado. The Ayvalık International Music Academy (AIMA) will not only be hosting a classical music festival in Ayvalık from July 27 to July 30, but they will also be offering master classes in classical instruments throughout the summer. Performances will be taking place at the Taksiyarhis Memorial Museum. Held throughout the months of July and August, this year's master classes will be violin and viola, guitar, breath work, violoncello and piano. Check out: www.ayvalikmusic.com for more info. 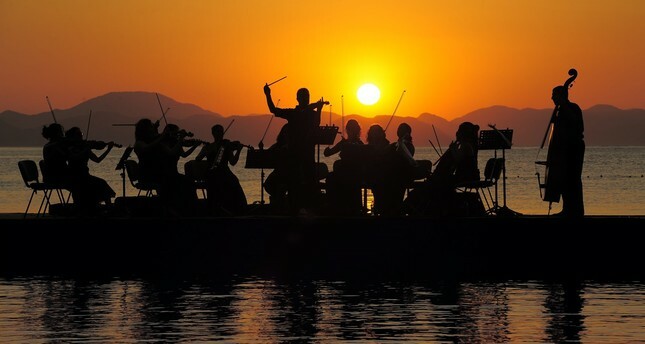 The Gümüşlük Classical Music Festival continues to transform this quaint town located in the Bodrum peninsula into a classical music paradise with quality performances held in spectacular authentic venues, such as a quarry, ancient church, and even a mud home. Performances in the dozens will begin taking place from July 26 until Sept. 4 and there will be master classes in flute, violin, violoncello and bass throughout the summer. Check out: www.gumuslukfestival.org to find out more about shows and classes.